There is no other kitchen style that has stood the test of time quite like the Shaker kitchen design, nor one so universal, suiting country cottages, grander period residences and postwar homes that eschew minimalist kitchens. The key to the timelessness of Shaker kitchens is their simple, unpretentious design, with no elaborate mouldings or fussy decoration. Find advice, inspiration and more in our guide to how to design a Shaker kitchen. If you need any more tips on planning, designing and furnishing your kitchen, you'll love our ultimate guide to kitchens. A Shaker style kitchen is simple, functional and easy to live with, making it a popular option for those in the process of designing a kitchen. We have loads of stylish Shaker kitchen design ideas in our gallery, too. What most sets Shaker style apart, is its unique history. The United Society of Believers, commonly known as the Shakers, were a religious group that broke away from the Quakers in the late 18th century, earning their moniker from the shaking motions and dancing used in their worship. Originating from Manchester, England, they emigrated to America, initially settling in New York before later spreading out across the region of New England. What did the Shakers believe? The Shakers were keen craftspeople, producing homespun furniture for their own, predominantly self-sufficient communities, and to sell on. They were known for the high quality of their workmanship, with Shaker furniture revered for being simple in style, durable and functional. They believed that manufactured goods should be honest in both construction and appearance, and that practices like veneering and applied ornamentation were ‘deceitful’. Although they did use decorative features, such as the heart or the ‘tree of life’, these were used sparingly. While other American designers used imported woods, such as mahogany and rosewood, Shakers made most things out of local timbers such as pine, maple and cherry. Most pieces were originally painted or stained, with popular colours blues, greens, reds, and yellows. In place of imported brass cabinet furniture, Shakers used simple turned-wood knobs. With such an appealing ethos of thoughtful, quality craftsmanship and simplicity of style, it’s no surprise that Shaker-inspired units have become a mainstay of modern kitchens. Designs, however, are rarely faithful, with the style’s clean lines lending a timeless backdrop to 21st-century appliances, smart kitchen storage and characterful accessories. While features such as side panelling and glass aren’t strictly Shaker features, they can be beautiful complements to new kitchens. When it comes to how to design a Shaker kitchen, think pared back. Simple, unadorned free-standing furniture made of real wood, either left natural or painted, with panelled unit doors, is a staple of the Shaker look. Buying separate modules will allow you to have the freedom to rearrange the layout in the future. If that’s not practical for your kitchen, then there are many manufacturers that produce beautiful built-in ranges. Where room allows, a central kitchen island or kitchen dresser, on which to display your treasures, will give the impression of a free-standing kitchen design. Browse our clever kitchen island design ideas for inspiration and find out how to design a freestanding kitchen using our specialist guide. Painting Shaker kitchen cabinets is a good way to update an existing kitchen and to get a bespoke look. Ideal colours are cream, muted green, pale grey-blue or pink, but even deep blue and red work well as accent colours, perhaps confined to just one statement piece. Combine two different colours, or natural and painted finishes, for a more characterful look, but don’t overdo it: if colouring the units, keep the walls neutral and vice versa. In addition, ‘avoid using patterns unless they are naïve and natural,’ says Helen Parker, deVOL’s Creative Director. Find out how to paint kitchen cabinets using our specialist guide. Our pick of the best paint for kitchen cabinets should point you in the right direction, too. If you're designing a Shaker kitchen, keep things simple. Traditionally, cabinet door furniture was timber knobs, painted or stained to match the units’ colours, but satin nickel knobs or cup handles are a good alternative. Worktops were also wooden, but more modern materials such as granite or quartz are often more practical and hardwearing, and will give the kitchen a contemporary edge. It’s important to include either open shelving with a few often-used objects, or glass-fronted wall units in the design, to break up a solid row of doors and let you show off beautiful glassware or china. You can find our more about the kitchen worktop options available in our guide to the best types of kitchen worktops – we've covered everything from granite, quartz and marble to laminate, glass and wood. The Shakers believed in having a place for everything and keeping everything in its place, making drawers and cupboards to fit each item exactly. Take a leaf out of their book by designing in specific kitchen storage for key items such as knives and a butcher’s block. 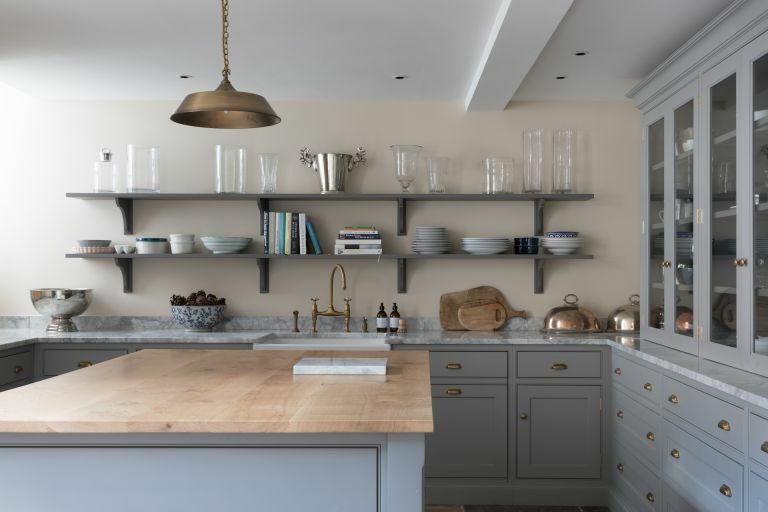 One instantly recognisable feature of Shaker kitchens is the peg rail, a simple strip of wood with round pegs, which was used to create wall storage space for coats, hats, brooms and even chairs while the room was cleaned. With new versions available from Shaker of Malvern, use one over worktops to display kitchen paraphernalia, blackboards, aprons and that Shaker symbol, the heart. Below the worktop, wicker storage baskets are ideal for a country look. Find more kitchen storage ideas in our guide. Or, if you're working with a small kitchen, try our storage ideas for small kitchens. Visit flea markets to search for old chairs to paint. The quintessential Shaker chair is upright with three horizontal struts across the back and a woven fabric seat, but any country-style chair will look good, such as the Windsor design. ‘Sourcing old chairs and a table will make the room more believable and less contrived,’ says Helen Parker. If there’s space for a main table, one with a wooden top and painted legs will be the perfect finishing touch. Remember you can always give old furniture a new lease of life with a coat of paint. Check out our guide to how to paint furniture for step-by-step instructions.